Dr. Billie Follensbee will serve as the curator of the collection. Springfield businessman and philanthropist Guy Mace donated a remarkable collection of art and artifacts to Missouri State University’s department of art and design. 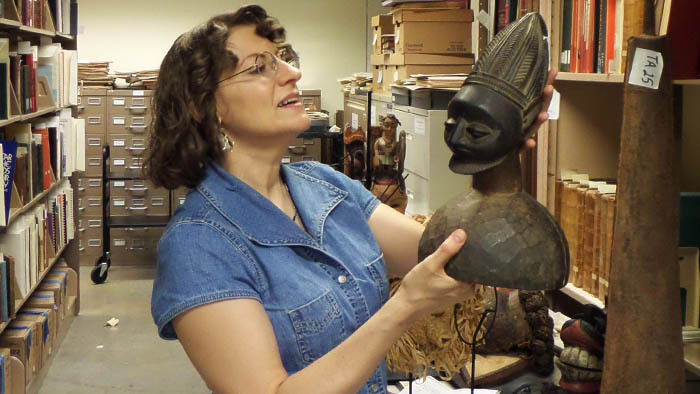 The collection includes African masks, figural wooden staffs and ceremonial knives and spears from the nineteenth and twentieth centuries along with Native American, Asian and Oceanic masks and headdresses. The new collections will be housed in archival space within Meyer Library provided by Thomas Peters, Missouri State dean of libraries. “These items are an outstanding addition,” Peters said. He noted the library’s plans for special cases and adjusted lighting, which will optimally display the exhibit. A preliminary exhibit of the new collection is being planned for the late fall or early spring. Missouri State’s department of art and design is the largest and one of the most varied publicly funded departments of art and design in Missouri. It is dedicated to providing quality curricular and extra-curricular experiences to develop culturally aware, independently minded and imaginative leaders by educating the next generation of creative thinkers in the visual and liberal arts, and to prepare individuals for careers in art, graphic design, illustration, art education and art history. The department is additionally dedicated to enhancing student and community understanding of and engagement with the visual dimensions of culture, serving the university and broader community through the Student Exhibition Center, the Brick City Gallery and other public venues and collaborative service activities.